http://www.JewishWorldReview.com | "The whole world is a narrow bridge," taught the great Chassidic master Rabbi Nachman of Breslav (1772 -1810), in one of his most famous aphorisms, "but the main thing is to have no fear at all." According to German scientist Jan Souman, however, it seems that we have good reason to be afraid. 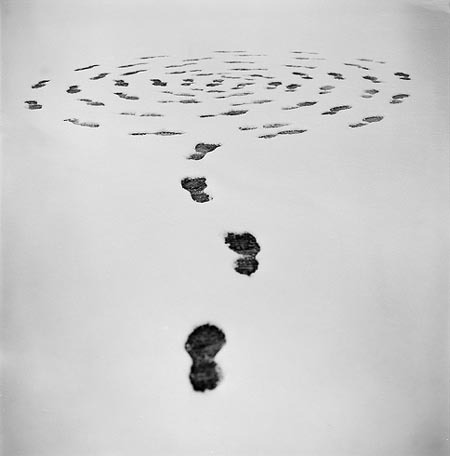 After exhaustive research devoted to the study of walking, Dr. Souman has amassed a mountain of evidence proving that human beings possess a natural inclination to travel in circles. Like some impious prankster, Dr. Souman took his subjects out to empty parking lots and open fields, blindfolded them, and instructed them to walk in a straight line. Some of them managed to keep to a straight course for ten or twenty paces; a few lasted for 50 or a hundred. But all of them ended up circling back toward their points of origin. Not many of them. Not most of them. Every last one of them. "And they have no idea," says Dr. Souman. "They were thinking that they were walking in a straight line all the time." Dr. Souman's research team explored every imaginable explanation. Some people turned to the right while others turned to the left, but the researchers could find no discernable pattern. Neither left-handed nor right-handed subjects as a group demonstrated any propensity for turning one way over the other; nor did subjects tested for either right- or left-brain dominance. The team even tried gluing a rubber soul to the bottom of one shoe to make one leg longer than the other. "It didn't make any difference at all," explains Dr. Souman. "So again, that is pretty random what people do." In fact, it isn't even limited to walking. Ask people to swim blindfolded or drive a car blindfolded and, no matter how determined they may be to go straight, they quickly begin describing peculiar looping circles in one direction or the other. And if, as the research indicates, human brains are hardwired to lead us in circles, why does Rabbi Nachman insist that "the main thing is to have no fear at all"? After all, a narrow bridge is a dangerous place to walk in circles. Perhaps the answer lies in the words of King Solomon: G-d made man straight, but mankind sought many intrigues (Ecclesiastes 7:29). The sages teach us that, in his original form, Adam towered above every other manner of creation and radiated a light of spiritual illumination. The inner purity of the First Man shone forth through the physical body that clothed his supernal soul, and the godliness that defined his essence drove him forward in unwavering pursuit of his divine purpose. But Adam allowed his desire for spiritual elevation to confound his reason, rationalizing that by consuming the forbidden fruit he could internalize the influence of evil and thereby conquer it from within. Despite his noble intentions, by violating the divine word Adam strayed from his straight course and lost himself amidst the winding paths of a crooked world. The history of Adam's descendants testifies to the crookedness of man. The moral corruption of the generation of the Flood, followed by rebellion in the form of the Tower of Babel, marked mankind's steady drift away from the path of Truth. The incipient Jewish nation, even before they had the opportunity to receive G-d's Law at Sinai, twisted their spiritual yearning into worship of the Golden Calf and condemned themselves to wander directionless in the desert for 40 years. Only upon entering their land did the Jews have another chance to find their way back to the straight and narrow. But again they lost their sense of purpose, refusing to accept upon themselves a leader who might steer them back on course toward a renewed national mission. And so the prophet declares that, "In those days there was no king; every man did what was upright (yashar) in his own eyes" (Judges 21:25). The Hebrew word yashar, rendered here as upright, translates literally as straight. Indeed, no matter how much the Jews may have then convinced themselves of the straightness of their path, they were truly wandering in circles. Dr. Souman explains what might otherwise seem obvious, that there is a simple solution to the circular inclinations of the internal human compass. With external clues, like a mountaintop or other promontory on the horizon, people have no trouble at all traveling a straight line. Perhaps now we are ready to appreciate the meaning of Rabbi Nachman's metaphor. We walk through life as if blindfolded, unable to see either the true nature of the world or the true purpose of our existence, bemused by all the material vanities that surround us and vie for our attention. The world is indeed a narrow bridge, with the winds of fad and fancy buffeting us on every side, relentlessly threatening to topple us into the abyss of spiritual oblivion if we place one foot off the path to either side. But if we raise our eyes above the fray, if we pull the blindfold from our eyes and set our sights upon the mountaintop that beckons us across 3300 years of history, then we can march confidently into the future with no fear of straying from the true course that promises to lead us safely home.